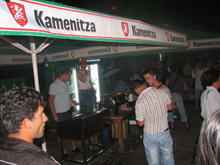 Bansko ski resort closed the season with a spectacular barbeque party. The municipality in Bansko was the organizer of the event. There was plenty of high quality alcohol and folk music. The event did not pass without a traditional ski competition. Three millionaires from Norway took part in the competition. One of them, Pike Christensen won in the age group of 50 - 55. The trade executive of Anzi Besson, a leading company for ski gear, who is a regular visitor in Bansko ski resort was also among the winners in the competition. President of the Bulgarian Ski Federation, Tseco Minev and his deputy Georgi Bobev were some of the guests at the closing gala. There were many local ski veterans and other winter sports professionals, who took part in the ski racing competitions at Yulen ski run, which was in ideally groomed for racing. " We close this season with lots of smiles and in a perfect mood. This season was very successful. All guests are enjoying themselves here. Our customers are more than pleased and that's what make us happy, " said the marketing director of the ski center, Ivan Obreikov. Today is the last working day for the staff of the ski lift as well. " I am more than happy that this day turned out to be a real winter celebration for guests and residents of Bansko. Our goal is to make Bansko a year - round resort, " said Bansko Mayor Alexander Kravarov.